The deets: J.Crew dress; Banana Republic necklace (old); Kelsi Dagger pumps; South Moon Under clutch (old); Revlon "Orange Flip" lipstick; OPI "The Thrill of Brazil" nails. This little red number is what I decided to wear to my third (but not final) wedding of the year. It was held in the cutest little historic village in NJ (I know I didn't know such a thing existed either). We stayed in a fancy barn and they had a tiny little train that ran throughout the half-mile wide town that you could hop on and off of. Red just seemed like the right color for the occasion. Whilst I was returning something at J.Crew with no intentions of buying anything (which is an inordinately hard task, I underestimated my weakness for bright classic pieces with a modern twist - blast you J.Crew! ), I saw it and just knew it would go splendidly with what I have dubbed as my "crazy-heavy-goes-with-EVERYTHING-necklace," which is exactly the problem. I want to wear this necklace all the time because 1. it quite literally matches every color in my closet and 2. I don't see a million other people rocking it like some other pieces I have purchased in the past *cough cough*bubble necklace*cough cough. * Any suggestions for places that I can get some new statement pieces that I wont see on every other style blogger that also wont break the bank? Is that too much to ask? I'm curious! Love this outfit! What a refreshing change from the bubble necklace too! I am loving the necklace and the colours of the stones! You are a wedding vet. I have only been to 1 in my whole life! Meeep! I have to find a cute wedding outfit for September...i love this though! I love that necklace! I've been perusing Etsy for some statement necklaces. I've also really been loving Bauble Bar and JewelIq. you look so classic here! i don't even OWN a bubble necklace because they're so damn EVERYWHERE! I'm wearing my Spike The Punch Addison necklace a lot--it's a statement, but you can pull it off. It's around $49 and though every blogger has the Rainey (guilty! ), far fewer have the Addison! Hey now, I still love my bubble necklace. True, I see it all over Pinterest and on every style blogger, but I have yet to actually see someone in real life wearing one. Apparently Indianapolis has not yet discovered the bubble necklace, so I'm going to keep feeling unique! But yes, yours IS more unique :) I guess Etsy might be a good place to find some unique jewelry, because you might find a shop that hasn't gotten a lot of publicity. That necklace is awesome, and it goes perfectly with that simple dress. 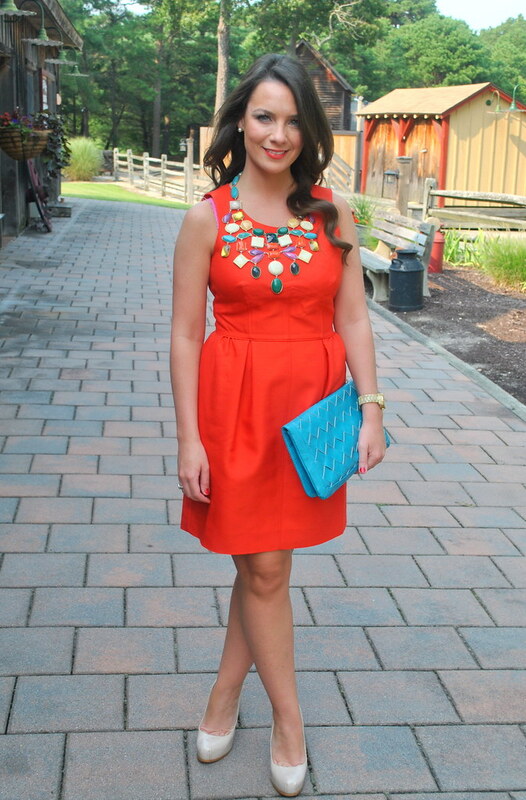 Such a beautiful dress on you and the necklace is just the most perfect accessory! Love you in red... and yes, that necklace is beyond amazing. Have you checked out Charming Charlie? They are kind of hit and miss for me, but have a wide selection of reasonably (read cheap!) statement necklaces! 3 cheers for wedding season... I have lost count but I think I am on wedding #6 this year, only 2 more to go! That necklace is beautiful and definitely unique! I agree about being over the bubble necklace which is the exact reason I never bought one. Cute dress too! You look stunning, Erin! 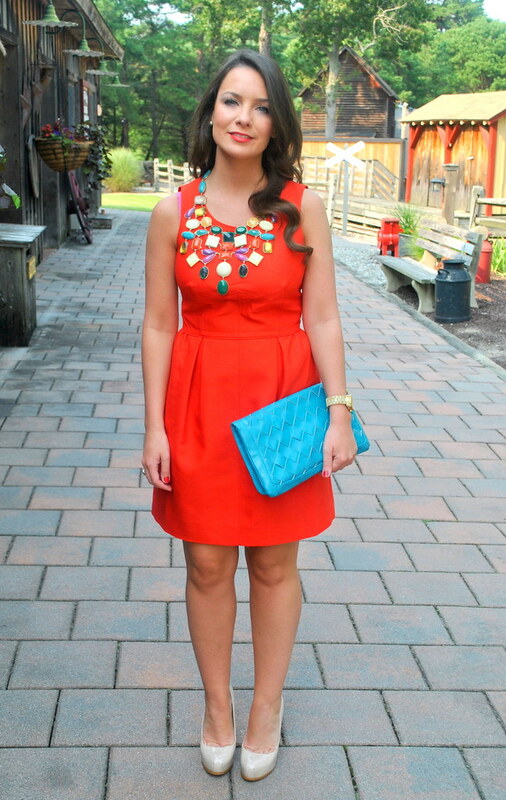 The necklace is the perfect accessory to that orange-y dress! I'm loving JEWELIQ for statement necklaces. SO pretty. Love the orange lips with the orange dress! Keep rocking that necklace...I have told you before how much I LOVE it. I still dig the bubble necklace, but looking for new pieces too. Etsy seems to be a great place and Francescas always has a fab selection too. Gorgeous outfit, loving that dress and the gorgeous necklace! I live in NJ and had no idea a place like that existed! Where in NJ was it, sounds like a cute little place. You look awesome! Francescas always has really cute accessories for good prices. I LOVE that you went so bold to a wedding, you look so pretty! I feel like sometimes people over-think their outfits and forget that it's a party...you want to wear something you can dance and have fun in! Honestly, you should check out Etsy for statement necklaces--I've found some really pretty ones there! Then there's also Anthro, but that tends to get pricey! I love this look. That necklace is so perfect. wow, lovely look! I adore the necklace and the color contrast of the red and the blue of the purse! You look great. The red dress is gorgeous! And I do love that necklace, such a great piece! What an awesome outfit!!! I love the necklace and clutch. This must be the year to get married. We've got 7 weddings this year and I heard from my husband it could be 9!!! That's just way too many outfits to put together. Haha. This is the best look I've seen all day, the necklace makes the outfit complete. beauty :) i have the same problem when i walk into j.crew and target. every time i step foot in those stores with no intention of buying anything, i usually walk out with something. savings fail. I love how you take a non-patterned dress (in this post, and a few posts back with the blue dress), and spice it up with accessories. I'm always afraid to buy a dress like that, but now I really really want to. Cute cute. that dress is gorgeous but that necklace is seriously AMAZING! i love it! Just found your blog and it has consumed my afternoon (while I was supposed to be working, lol). You are stunning! Love your style and wit! And the dress is fantastic... just saw something similar in Kohl's and you make me want to go buy it right now! Love all the colors! especially that fabulous clutch!